Purée the mango or other fruit of your choice in a food processor or blender. When the mixture is perfectly smooth, mix in the sugar syrup and freshly squeezed lemon juice.Now take the resulting 'batter' and chill it in the fridge for at least 20 minutes to get it nice and cold and allow the flavors to meld. Pour the batter in an ice cream maker, following the instructions. Most will tell you to churn the batter for about 20-30 minutes. You can tell it's done when the batter clings to the paddle. 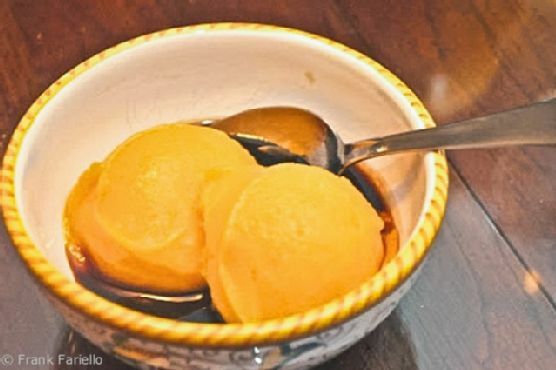 The resulting sorbetto can be served as is�? ?if you like a 'soft serve' consistency�? ?or placed in the freezer for an hour or two if you like a firmer consistency.